We asked for feedback on a proposal to implement MULTICOM 126.7 up to 5,000 feet AMSL in low level airspace at uncharted aerodromes, and to expand the radius of common traffic advisory frequency (CTAF) areas to 20 nautical miles. The aim of the proposal was to implement MULTICOM 126.7 and enhance safety benefits for VFR and IFR aircraft, protect passenger transport operations and keep air traffic control transmissions separate from general transmissions at aerodromes. We received 1,064 survey responses to this consultation and some written submissions. Overall, 42.8% of survey respondents supported the proposal and 57.2% of respondents did not support the proposal. Respondents raised a number of important issues and concerns requiring further consideration. radio carriage and workload implications for hang gliders and paragliders. Due to the issues raised during consultation, CASA will not implement this proposal. In acknowledgement of the broad support for the MULTICOM 126.7 component of this proposal, CASA is developing a new option that will be released for consultation later this month. A summary of consultation and individual responses are published below. monitor and broadcast on 126.7 MHz (MULTICOM). More than eighty per cent of respondents to the discussion paper supported establishing MULTICOM 126.7 MHz as the frequency to use in low level airspace. This proposal has been considered and endorsed by the Aviation Safety Advisory Panel (ASAP). The proposed changes reflect the preferences of the aviation community, while taking into account future airspace design and safety considerations for both visual flight rules (VFR) and instrument flight rules (IFR) pilots. The intent of changing the procedures for radio frequency use in low level airspace is to maximise the opportunity for aircraft operating at low level in Class G airspace to be on the same frequency and to make and receive broadcasts for 'alerted see-and-avoid'. To ensure safe and effective implementation, common traffic advisory frequency (CTAF) areas would be expanded under the proposal. This will ensure that aircraft conducting instrument approaches are on the same frequency as aerodrome traffic, prevent multiple frequency changes during climb and descent and ensure transmissions at busy aerodromes do not experience clutter from the MULTICOM frequency. 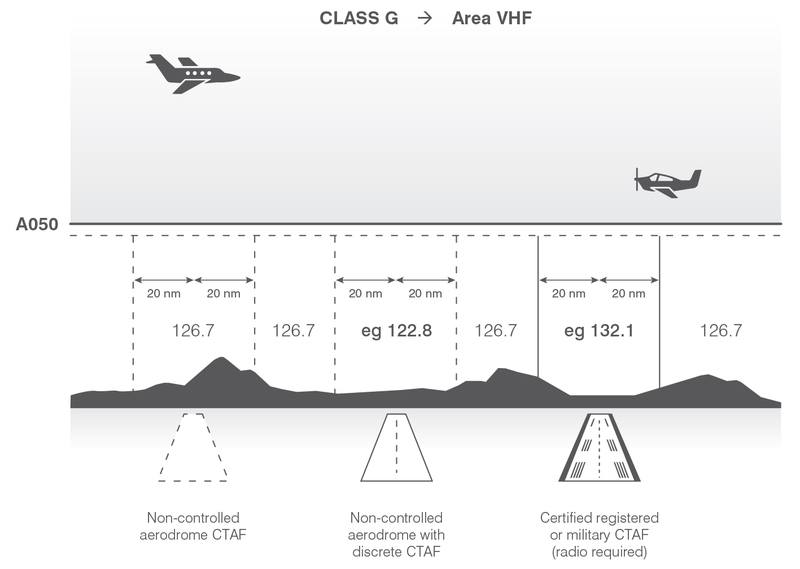 This change would allow VFR and IFR aircraft to monitor and broadcast on the MULTICOM frequency of 126.7 MHz up to but not including 5,000 feet AMSL in Class G airspace where a discrete frequency, such as a CTAF or broadcast area, does not exist. At non-controlled aerodromes this change would expand the volume of airspace contained in the CTAF to a 20 nautical mile radius laterally and up to, but not including, 5,000 feet AMSL vertically. For the few aerodromes with an elevation of 3,000 feet AMSL or higher, the vertical limits would extend to 3,500 feet AGL. Together, these elements provide safety benefits for both IFR and VFR flights, provide additional protection for passenger transport operations and reflect the strong preference from the aviation community for keeping air traffic control transmissions separate from general transmissions, particularly at aerodromes. Image: The proposed changes to radio frequency use in low level airspace. Following consultation, these changes may be implemented by mid-2018 and the aviation community will be advised. If the changes are adopted, CASA will provide an awareness and education program to ensure pilots are aware of the new procedures and have the necessary guidance and information. CASA will continue to review radio broadcasts and establishing further discrete frequencies would be considered if any issues of congestion arise as a result of any changes to radio frequency advice. CASA would like to hear from all airspace users on whether the proposal should be accepted. The results of the consultation will influence whether the proposal will be implemented. ﻿The proposed changes are open for public consultation until 12 January 2018.